Wells Fargo has more locations than any other bank, and is among the top small business loan providers. Simply put, Wells Fargo’s reach goes beyond anyone else’s, and their services can suit any business. Many customers may be wary of banking with Wells Fargo following the revelations of the last few years. There is good reason for that. Wells Fargo misused customer data and assessed users undisclosed fees for unused services, among other issues. But Wells Fargo is still the most accessible bank in the country, and there are plenty of reasons to bank with them. Recently, they have taken steps to increase their fee transparency and offer new customer incentives. Their suite of business banking products can meet the needs of any business, and adjust to your needs as you grow. They offer three conventional business checking options as well as their Analyzed Business Checking, for those businesses with more complex suitabilities. Who is Wells Fargo Banking right for? Any business looking for a physical location and an ongoing relationship with their bank can benefit from joining Wells Fargo’s network. Chase Bank offers banking options for every business owner, no matter the size of your company. Who should open a Simple Business Checking Account? New businesses with lower account balances and transaction flows should start with a Simple Business Checking account. Who should open a Business Choice Checking Account? Business Choice Checking is ideal for growing businesses with steady banking activity, but relatively low balances. Who should open a Platinum Business Checking Account? Platinum Business Checking is a good package for established businesses with high balances or multiple accounts and steady financial activity. Who should open an Analyzed Business Checking Account? An Analyzed Business Checking account is suited for large companies with complex account management needs. Who should open a Business Market Rate Savings Account? The Business Market Rate Savings account is a good starter savings account for new and growing businesses. Who should open a Business Platinum Savings Account? Who should open a Business Time Account? For businesses with surplus cash reserves, a Business Time Account may be a strong savings option. A big source of Wells Fargo’s value comes from their fairly low costs. The vast majority of customers will not have to pay monthly service fees, and they have made communicating all other fees a priority. 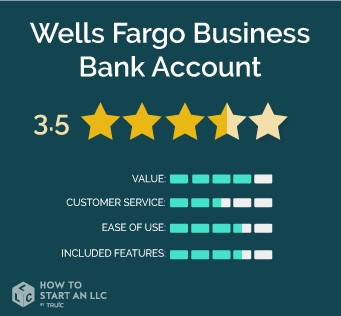 They offer optional overdraft protection, as well as frequent sign-up incentives for other Wells Fargo business products and loans. At the platinum checking level, there aren’t even fees for stop payment requests, money orders, or your first two monthly domestic wire transfers. On the other hand, Wells Fargo’s interest rates are underwhelming. They don’t offer much in the way of extra features, at least for customers just looking for banking services. Still, there’s something to be said for a steady, low-cost bank with a wide range of locations and additional services. We’d recommend being diligent about your account statements, but Wells Fargo can certainly work for a lot of businesses. We experienced long wait times on Wells Fargo’s customer support line, and when we did talk to a rep, they often tried to pitch us other Wells Fargo products. There is no online chat function, and customer service emails are not immediate. You also have to pay a fee for check image functionality and their mobile banking app can be buggy, which hurts the overall user experience. It is important to mention that Wells Fargo has the most branches of any bank nationwide. So while experiences with your local bank will vary, their customer service will likely be much better than the Wells Fargo corporate resources. With 13,000 ATMs and 5,800 locations, as well as a tiered system of business banking products, Wells Fargo can help you no matter how your business develops. Their small business loans are typically pretty easy to access. They also sync their additional business products extremely well. As Wells Fargo continues to take steps to build transparency, life will get easier for business owners in their network. Wells Fargo does not offer a huge host of premium features, but they do add enough value to remain interesting for businesses at all levels. They include debit card overdraft service and optional overdraft protection. At every level, users get low foreign transaction fees, text and mobile banking, and Zero Liability Protection. Platinum Checking customers get stop payment requests, money orders, cashier’s checks, and more included. For high-level customers, Analyzed Business Checking gets you Treasury Management Services and access to the Commercial Electronic Office portal, which help track your finances and manage expenses. Wells Fargo also offers CDs, which are not offered by all of their competitors. Of course, we would like to see more benefits offered. There’s not much in the way of incentives for higher-volume accounts or perks like savings rewards. Still, the entire banking package Wells Fargo puts together is fairly comprehensive. Wells Fargo has the widest reach of all banks in the US, and their other business support products can often prove useful. No matter what changes your business goes through, they can meet your needs. Plus, they often work with small businesses to provide unique offers or adjust services. So while Wells Fargo may not have the highest interest rates or the most complex special features, they get the job done for many businesses.